This summer I will be embarking on an adventure of a lifetime. Back in high school I bought a 10-speed bicycle. I started hearing stories of people doing long rides across parts of the country and I remember thinking how amazing it would be to ride across Canada. I even tried one camping trip on my bicycle that, without proper gear, turned into a bit of a disaster. I dreamed of riding from coast to coast but the logistics of doing so were beyond me at the time. With starting university and getting on with life, the dream got pushed into the background. Several years ago, at a golf tournament, I won a mountain bike. After being away from it for many years, I started riding again. The following Spring I bought a road bike and joined a group of friends riding in the MS Bike Tour from Leduc to Camrose and back. As an off-shoot of training for this ride each year a group of us continued to meet Saturday mornings to go cycling. On one of these rides I met John who told us about a ride he had done across Canada a couple of years earlier. This made my ears perk up. He had done the ride as part of an organised tour called Tour du Canada. John’s enthusiasm about the Tour was infectious and my long abandoned dream re-emerged from the deep recesses of my mind. Here was a company that looked after the logistics of the ride. You camp every night and the group shares the tasks of cooking dinner and breakfast. Here was a chance for my dream to become a reality. 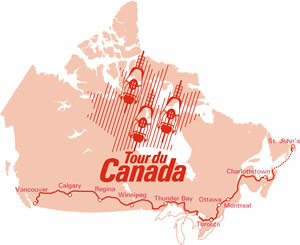 I checked out the TdC website … www.tourducanada.com … which provided lots more information. The question became not “if I would do it?” but “when would I do it?”. Intitially another friend was seriously thinking about riding it with me but a change in career for her ended those plans. For a variety of reasons I settled on 2013 as the year to do the tour. The first step was to take out a membership in Tour du Canada which I did in January 2011. Membership gave me access to an online bulletin board where past and future riders post comments, ask questions, answer questions, or provide advice. It is an amazing resource where I’ve learned a lot of valuable information. John has since moved to Parksville but we have kept in touch and he has been a great source of information and inspiration. The next major step was to buy an appropriate bicycle. My road bike is carbon fibre and just wouldn’t stand up to the pounding it would take on a cross-country ride. There were many discussions about bikes on the TdC online forum but the one bike that seemed to be the most popular with past riders was the Trek 520. 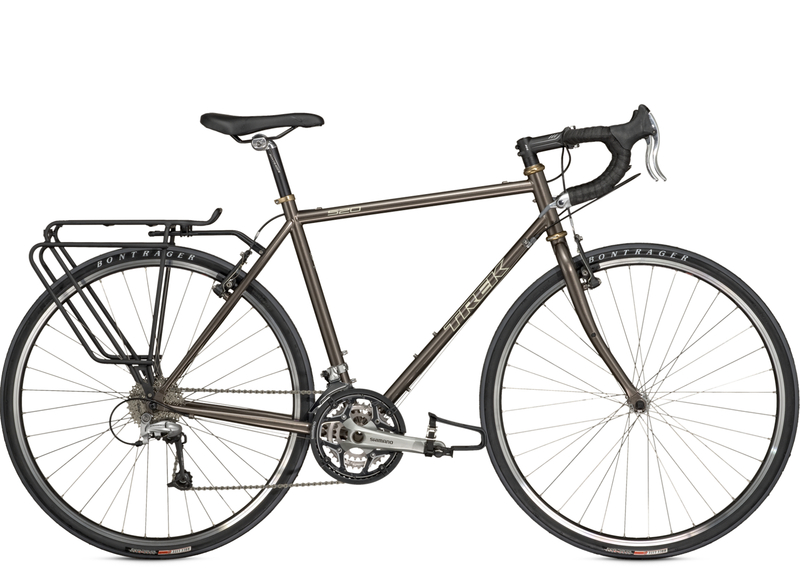 It is a touring bicycle which means it is a little sturdier and has slightly larger tires than a traditional road bike. 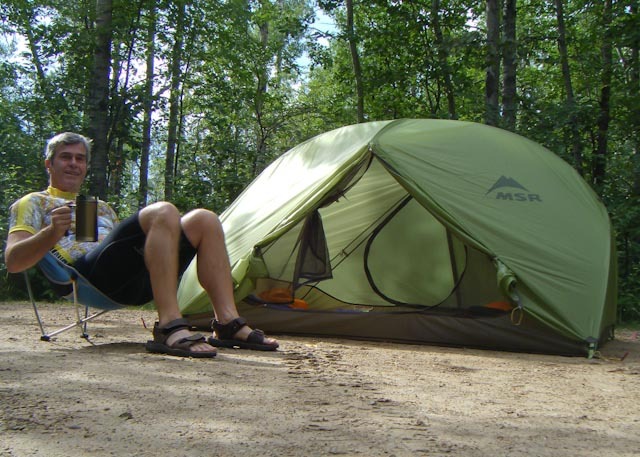 In February 2012 I ordered the bike through Cranky’s Bike Shop in St. Albert.Over the course of the summer I bought camping supplies and went on a few camping trips to get used to the gear. The only major thing left to do now was to sign up for the tour. As soon as registration opened up last Fall I sent in my forms. On November 21st received confirmation that I was in! Over the past months additional riders have announced their participation in this summer’s tour. At the moment we are a group of 17 ranging in age from 24 to 71 comprised of 14 women and 13 men. There are also 2 vets joining us: a woman who rode the Tour in 2009 and a fellow who will ride the portion of the tour he missed last summer (Drumheller to Tottenham) due to an injury. We are an international group with a rider from Australia, one from California, and one from England. The rest of the riders are from across Canada from the Yukon to Quebec. I have been in touch with Michel from Calgary. We plan on doing a training ride together in late May or early June somewhere in the Red Deer area. The Tour officially starts June 20th at UBC in Vancouver with an orientation day. Most of us, though, are doing the optional 2-day Victoria trip: riding to Victoria on the 18th, dipping our wheels in the water at Mile 0 of the Trans Canada Highway and returning to UBC on the 19th. We depart UBC on June 21st and finish with a ride up Signal Hill in St. John’s, NL on August 29th. In between we will cover a distance of 7,655 km over 71 days averaging 130 km per day. There will b 9 days of riding 100 km or less, 18 days between 101 and 130 km, 25 days between 131 and 160 km, and 7 days of rides exceeding 160 km. Aside from Vancouver and St. John’s, we will stay indoors in Thunder Bay, Ottaw and Quebec City. All other nights will be spent in a tent. We will have 11 rest days to which to look forward. Susan will drive out to Vancouver with me in June and will meet me in St. John’s at the end of August. The Tour du Canada will allow me to experience Canada in a way that few have done. It will truly be a journey of a lifetime! This entry was posted in Cycling, Tour du Canada and tagged Tour du Canada. Bookmark the permalink. Buddy, you know how much I’d like to be on the tour with you! I’m envious but so happy for you that you’re able to fulfil your dream. Looking forward to riding with you before the tour and your updates as you pedal across the country. Good luck my friend. James. Thanks James. I’m counting on you getting me through some of those training rides!